Before I talk about my nails, let me just say, I never knew I had such odd looking hands til I saw this photo! Maybe it’s because I’m not wearing my trademark bling rings or the fact my knuckles are all messed up from going nuts at boxing last week (you can still see the scabs because I punched til I bled!!!) or because I have small, skinny hands. Whatever it is, this photo kid of freaked me out! Anyway, here are my new nails! I am pretty excited about these because they’re BLUE which is not usually a colour I deal with often, and yet the colour is amazing! I got them done last week in a dark, shiny royal blue which looked divine til they got a bit knocked around and so needed a lift. 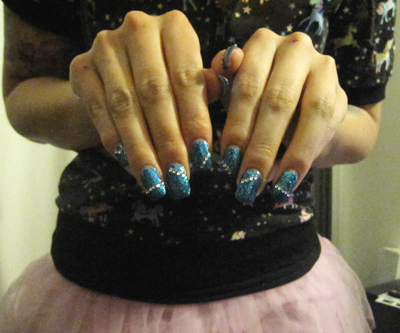 I bought some el-cheapo blue glitter polish from the chemist and BAM it brought them to life. I had planned to use some of my favourite nail stickers but I knew I needed to do something bigger and more intense so I finally used my nail diamantes in varying patterns. This was my first attempt at bejeweling my own nails and I am so proud of myself I have been showing them off to anyone who’ll look at them! It was surprisingly easy too, I just gave them a thick coat of polish, used a scalpel to pick up each diamante (dip the tip of the scalpel into the polish first so that they stick) and pop them in place. 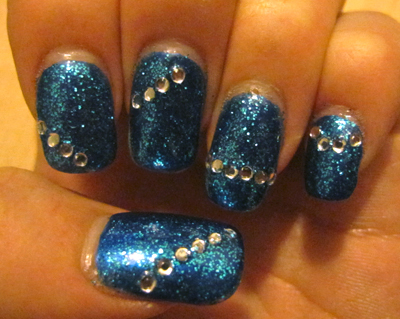 One my nails were just about dry I gave them four layers of top coat to keep the jewels in place. I just discovered Revitanail Top Coat and OMG it is great. Much thinner than I’ve used before but holy cow is it super quick drying! Meanwhile, in other news: MEET OUR NEW POODLE! Technically he’s my mum’s BUT he’s still a part of our family! We got him from the RSPCA on Saturday on a bit of a whim, though we have been talking about mum getting a dog for a little while now. It’s been just over a year since our beautiful Belle passed away and it was a massive thing to get over. I feel a bit bad that the new poodle looks exactly like Belle but he stole our hearts as soon as we met him. 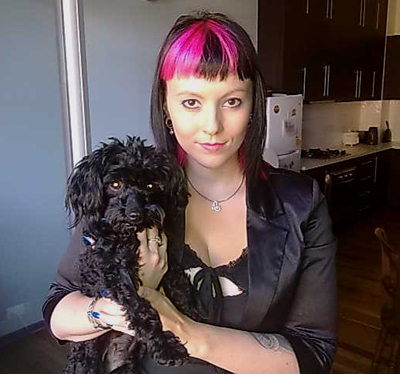 He’s a toy poodle and apparently was rescued from a puppy farm that was raided about two months ago. He has a malaligned jaw which means the top and bottom jaws don’t quite meet which means one of his lower canines juts out (it’s hilariously cute) but it doesn’t cause any discomfort so nothing to worry about. He’s very quiet but seems really relaxed, he’s shown a few signs of nervousness but nothing to match the massive changes he’s gone through so suddenly. He’s two and a half so over his puppy phase but still young and active. We’ve not yet named him. He was called Smudge but we want to give him a suave French name though nothing is striking us as appropriate so far. After all our last two poodles were called Pepe and Belle which were so perfect and cute and as it turns out, impossible to beat! Hopefully we’ll think of something soon, and once we do you will get many updates about how he’s going! Nails look fabulous! I ended up breaking my acrylics, then didn't have the money to get them fixed & then infills, so I removed them. However, since then, I've not bitten them once! I've lasted 4 days so far! LOL, it's like a record for me, so I have long nails for me. I've decided, that seeing i'm growing my own nails, I am going to reward myself with pretty nail polishes and such. :D So keep up these post so I can use them as inspiration!! Love your nails! I'm a nail polish fiend myself. I love your blog. You're so cute! Hooray for RSPCA adoption :D Good stuff. he's a cutie. Ooh, what a cool colour! :) And that pup is adorable.